These are the words of author Kahlil Gibran from what I think may be the greatest love story, “Broken Wings.” But this quotation isn’t about romance. At least that is not why I quote Gibran today. Today I am writing about secret secrets. The ones we even hide from ourselves. We hide the parts of ourselves that scare us. The parts our parents told us were shameful. The parts our spouse finds embarrassing. The parts that challenge norms and conventions. The parts that don’t fit in at work. The parts that didn’t lead directly to a field of study and a job. We do not give ourselves permission to fully be ourselves. This is known as the Johari Window. (I personally stretched my graphic design skills to design a pretty image for you. 😉 ) Notice the large light blue square–the Free or Public Self–this represents the part of our personality that we freely exhibit. The Facade or Hidden Self is at the top of the image in a darker blue to signify that this part of ourselves is obscured. We intentionally hide this part of ourselves from the world because we are told it is unlikable or inappropriate. 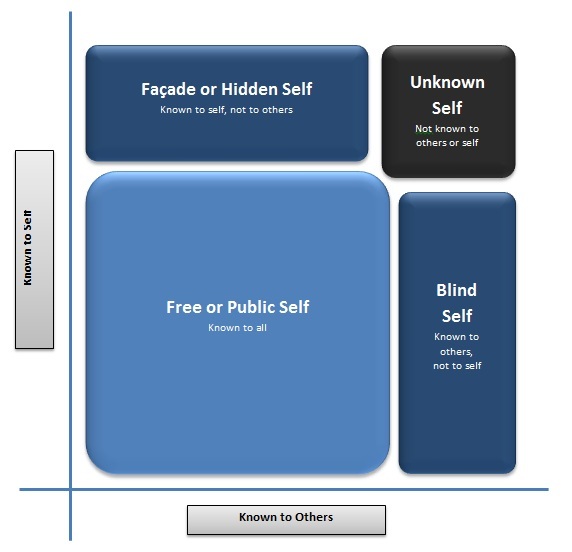 The Blind Self is the second dark blue box at the bottom right. This is another part of ourselves we obscure from view; however, we do this subconsciously. In fact, those who know us well see right through us and know this segment of our personality, even if we aren’t aware of it ourselves. Finally, the most obscure part of the self is the Unknown Self. This part isn’t visible to the individual or others. It is a segment of our personality that we completely deny and with great effectiveness. Obscuring parts of yourself makes it possible to protect your vulnerabilities. But what is the cost? Are you less happy, proud, satisfied, rewarded, challenged, confident, etc. … than you could be?